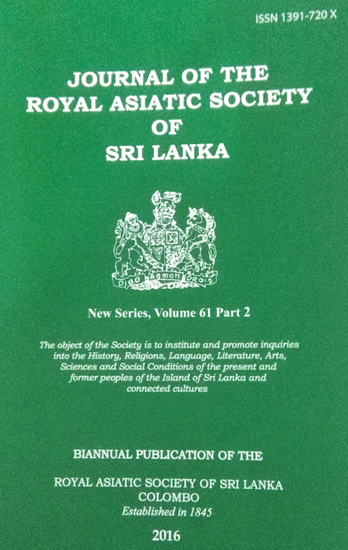 The Journals of the Royal Asiatic Society of Sri Lanka (JRAS), Volume 61 Part 1 for the year of 2016 contains three articles, a book review and ‘a tribute’. They are : Mahinda Somathilake on ‘Ajanta Murals and their Chronology : A Critical Analysis’ from pages 1 to 32, Chandana Jayawardene on ‘Counting and Computation Abilities in Early Sri Lanka : A Review based on Buddhist Literature’ from page 33 to 68 and Sarath Chandrajeewa on ‘Vehragala Avalokitesvara Bodhisatva : An Inquiry into Its Style and Period (The Mahayana Buddhist Bronze Statue in Colombo Museum)’ from pages 69 to 106, the review by Anad Singh on the book titled : ‘Buddhism at Sãranãth’ is found from pages 107 to 110 and the tribute of Hema Goonetileke on Dr. Christopher Reynolds is from pages 111 to 113 of the journal. The second comment, which this reviewer wishes to place on record is that the reference found in D. B. Dhanapala’s ‘Buddhist paintings from shrines and temples in Ceylon’ Collins London 1964 on the significance of Ajanta cave Buddhist paintings for Sri Lanka. Though the learned writer attaches a foot note at page 16 of the journal but it is in a different context from the very same book cited by the reviewer i.e. cave 17 paintings on the advent of King Vijaya. Three scenes found in the cave 17 would have been a merit worthy point of comment for the learned writer at least in a foot note; aptly it is the only place of connection to the Sinhala Culture. The first scene from the Simhala Avadana which depicts: “The army on the march, led by Simhala who is riding a white elephant.” The second scene also from Simhala Avadana which depicts: “Under a tent, Simhala and one of the ogresses, momentarily transformed into a beautiful woman, are conversing while, to the left, other ogresses are engaged in their gruesome practices”. The third scene is also from Simhala Avadana which depicts: “The sacred horse and its groom.” Cave 17 is somewhat is dealt with by Sarath Chandrajeewa at P79-80 in the same issue in his article. The painting on the advent of King Vijaya has had adorned the ‘Sinhala Bauddhaya’ commemorative issue in 1915. The third comment which this reviewer wishes to make on this article is that Vini Vitharana in his ‘Sri Lanka – the Geographical Vision’ Department of Educational Publications Sri Lanka 1996. (The thesis accepted by the University of Ceylon Peradeniya for the Degree of Doctor of Philosophy - 1966) at page 195 he states that: “Mookerji (1957, 29-30) (History of Indian Shipping) believes that the Jãtakas such as the Mahãjanaka, Valãhassa and Sankha and the story of Vijaya stand evidence to the prevalence of large ship in Sri Lankan waters during the ancient times. He also presents several bits of sculptural, artistic and numismatic evidence from Sãnchi, Kanheri, Andhra, Ajantã and Borobudur ranging from 2nd century BC to the 11th century AD in support of a claim for the prevalence of extensive shipping in the Indian Ocean (ibid 35, 41-42, 45-50)’. This reviewer neither sees any iota of material cited by the learned writer on numismatic evidence nor on Mukerji cited to by Vitharana supra. The second article of Chandana Jayawardene based on Buddhist Literature does not say whether it is published or unpublished literature. The article does not cite the following: B. C. Law’s ‘History Pali Literature of Ceylon Vol. I and II London 1933. Louis de Zoysa’s ‘Catalogue of Pali, Sinhalese, and Sanskrit Manuscripts in the Ceylon Government Oriental Library Colombo’ 1876 and the ‘Catalogue of Pali, Sinhalese and Sanskrit Manuscripts in the Temple Libraries of Ceylon’. Colombo 1885. D. M. de Z. Wickramasinghe’s ‘Catalogue of Sinhalese Mss in the British Museum’ London 1900 and the ‘Catalogue of the Sinhalese Printed Books in the Library of the British Museum’ 1901, A. B. Keith’s ‘History of Sanskrit Literature’ Oxford 1928, W. A. de Silva’s ‘Catalogue of Palm Leaf Manuscripts’ (Memoirs of the Colombo Museum) Vol I 1938, James de Alwis’s ‘A Descriptive Catalogue of Sanskrit, Pali and Sinhalese Literary Works of Ceylon’, Vol I (1870) 2 and 3, William Skeen Government Printer Colombo and Somapala Jayawardhana’s Hand book of Pali Literature Colombo 1994. Another noteworthy omission is that Wilhelm Geiger’s ‘Culture of Ceylon in Medieval Times’ edited by Heinz Bechert Wiesbaden : Otto Harrassowitz 1960 which is not cited to in his article. The third article is by Sarath Chandrajeewa. This reviewer fervently believes that it is Veheragala where the title is found as Veragala (see: first paragraph it is referred to as Veharagala) How did this error seep in throughout the article? At page 04 of the journal this reviewer finds a photo of the Avalokithesvara Bodhisattva. But curiously at P31 of the journal in Somathileke’s article cave 1 part of a photo of Ajanta Cave paintings: Padmapani Bodhisattva typically resembles Avalokitesvara Bodhisattva of Veheragala in Sarath Chandrajeewa’s article. Sarath Chandrajeewa in his article totally ignores this painting or Nandasena Mudiyanse’s account cited by this reviewer. This reviewer finds a photograph which appears in the Wikipedia free encyclopaedia on Avalokitesvara Bodhisatva ‘a bronze statue of Avalokitesvara from Sri Lanka CA 750 CE from Burmingham Museum of Art’ is also not adverted to by Sarath Chandrajeewa in his article. This reviewer is of the fervent opinion that cave 1 of Ajanta mural painting Padmapãni Bodhisattva furnishes the right hand clue of posture of the carrying a flower in statue of Veheragala. Any observer would find that these two have strikingly similar features. Curiously Sarath Chandrajeewa aptly agrees with the reviewer though he has not cited cave 1 painting of the Ajanta murals. John Clifford Holt in his book titled ‘Buddha in the Crown Avalokitesvara in the Buddhist Tradition of Sri Lanka’ Oxford University press 1991 states that the first to fourth statues from Tiriyaya cited in his work from Ulrich Von Shroeders’ book, the figure 12 (Holt’s) the bronze statuette from Boston Museum belongs to Ananda Coomaraswamy’s collection, figure 16 of Holt from Natha devale from Kandy all there statues are in lion’s roar posture – thus lokeshwara features.” Nandasena Mudiyanse’s ‘Mahãyãna Monuments of Ceylon,’ M. D. Gunasena Colombo 1967 is not referred to by the learned author. Pl to Pl 14 contains no accreditations to the photographs that appear therein. Did the JRAS violate the copyrights of a previous photographer or an author? 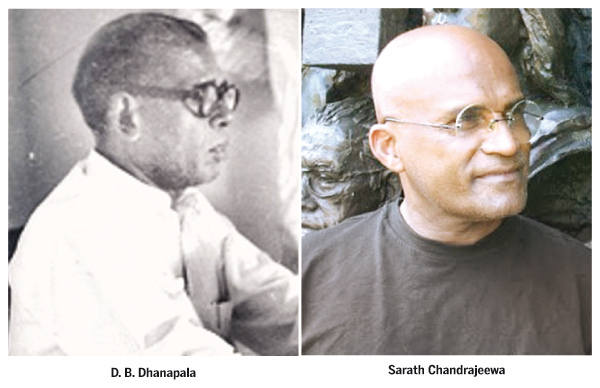 The Part 2 of Volume 61 New Series of the JRAS the contents reads as follows: Shanthi Jayawardene’s ‘Uri Lanka’s Tãrã Devi,’ from pages 1 to 20, S. Sarath Mathilal de Silva’s ‘The Concept of Equality : its Scope, Developments and International Legal Regime’ from pages 31 to 54, Ramla Wahab-Salman’s ‘A History of the ‘Ceylon Moor’ Press (1882 - 1889) from pages 55 to 70, Susantha Goonetileke’s ‘Happiness and the Psychological Contents of Anuradhapura Society’ from pages 71 to 88 and Uda Hettige’s Tribute on Prof. Senaka Bandaranayake from pages 89 to 90. It is evident that JRAS part 2 is a slimmer and contains less pages than the part 1 because it has only ninety pages. JRAS Part 1 is only replete with hundred and twelve pages. Once this reviewer perused the first article in part 2 volume 61 only he could realize that ‘Uri Lanka’ is an error for ‘Sri Lanka’ – it is a ‘printer’s devil’! This article on ‘Tara devi’ is on a museum object found in the British Museum. The article neither contains the museum object inventory reference number of figure 1 nor of figure 2 solid cast gilt bronze 0.17 meters Tara Devi. The writer Shanti Jayawardene has even not attempted to trace at least the museum object number of figure 3 Tara Devi seated found in the National Museum Colombo nor figure 11 Avalokitesvara Tiriyãya cited in page 9 JRAS. This reviewer finds it as a sine qua non to identify the museum object by the museum inventory number as the museum inventory contains information that would have furnished the reader of the RAS of the day it reached the museum and how it reached the museum the background of the object of study to the academic or the member of RAS. The article on ‘Sri Lanka’s Tãrã Devi contains figure 1 to figure 27. This reviewer did not find any of these figures are mentioned or referred in the article in parenthesis. The reviewer identifies this as a lapse in the JRAS. Another salient omission by Shanthi Jayawardene is that he has not referred to U Von Schroeder’s ‘The Golden Age of Sculpture in Sri Lanka’ Visual Dharma Publication, Hong Kong 1990. vide: at 90 -1 Samadhi Goddess (no 30) is Jayawardene’s figure 3 where National Museum object no. 40.474.144 registered in 1940. The next comment which the reviewer wishes to make is that a new unaccepted way of writing has emerged by the figures provided therein. That is by mentioning the once who holds the copyright i.e. © British Museum, © National Museum, © Ulrich Von Schroeder, © CCF and © Senake Bandaranayake. This reviewer condemns this mode of writing as it is a sheer violation of the copyright law of the country. The next article is written by S. Sarath Mathilal de Silva on the ‘The Concept of Equality: Its Scope, Developments and International Legal Regime’ The writer is identified at the beginning of the article itself as an Attorney-at-Law in which hitherto is not found at the beginning of an article in the JRAS. The third article is by Ramla Wahab-Salman on ‘A History of the ‘Ceylon Moor’ press (1882-1889) which refers to Orabi Pasha – page 65-6 in the JRAS Part 2. This reviewer finds that a book published by Frewin and Co. Colombo in 1983 titled: ‘Orabi Pasha – The Egyptian Exiles in Ceylon’ written by A. C. Dep. is not referred to by the writer Wahab – Salman. Arnold Wright’s ‘Twentieth Century Impressions of Ceylon’ 1903 also contains some material on Orabi Pasha. Wahab - Salman has turned a blind eye to the said material. This reviewer’s next comment is that she even has not referred to Dr. Lorna Dewaraja’s ‘History of Muslims in Sri Lanka’ authoritative book published for Muslim of Sri Lanka 1994.